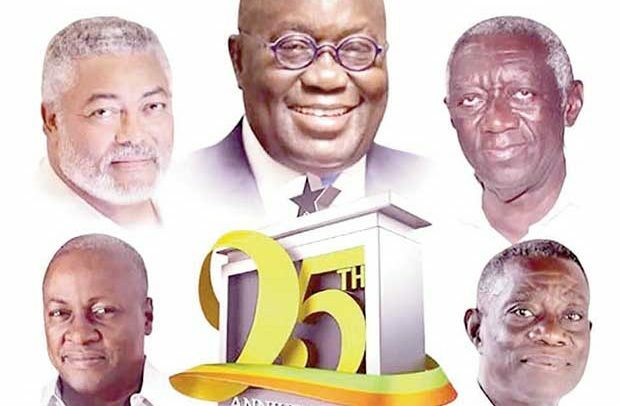 It was a sight to behold at the Independence Square when all three living former presidents – Jerry John Rawlings, John Agyekum Kufuor and John Dramani Mahama – joined incumbent President Akufo-Addo and thousands of Ghanaians to celebrate the 25th anniversary of Ghana’s Fourth Republic. The ‘Celebration of the Goodness of the Lord’ as was themed the thanksgiving service saw many people, including former and current government officials, as well as representatives of the various political parties and the clergy in attendance. DAILY GUIDE looks at Ghana’s achievements in the last 25 years, as well as challenges that still confront the development of the country. On March 6, 1957, Ghana gained independence from Great Britain, with late President Kwame Nkrumah of the Convention People’s Party (CPP) serving as its first prime minister. In 1960, the country was declared a republic, and by then, Dr Nkrumah had succeeded in making it a one party state, with his CPP administration. However, on February 24, 1966, Dr Nkrumah’s administration was overthrown and subsequently, a National Liberation Council (NLC), headed by Lt General Joseph Arthur Ankrah, was formed to administer the country. General Ankrah was later removed from office in April 1969 and Lt General Akwasi Amankwa Afrifa became the chairman of the NLC, giving way to a three-man Presidential Commission, with General Afrifa as chairman. That paved the way for a general election in 1969 which brought into power the Progress Party government, with Dr Kofi Abrefa Busia as Prime Minister and Edward Akufo-Addo as president. In 1972, there was the military overthrow of the Second Republic, again by the Ghana Armed Forces and General Ignatius Kutu Acheampong took over as head of state and chairman of the National Redemption Council (NRC). The NRC later changed to the Supreme Military Council (SMC), with General Acheampong being replaced by General F.W.K. Akuffo in a palace coup in July 1978. In a mass revolt of junior officers of the Ghana Armed Forces, the SMC was also toppled in 1979, and following that uprising, an Armed Forces Revolutionary Council (AFRC) was set up under the chairmanship of Flt Lt Jerry John Rawlings. The AFRC carried under the supervision of Rawlings out what it termed as a house-cleaning exercise in the armed forces and society at large, with the aim of restoring a sense of moral responsibility and the principle of accountability and probity in public life. AFRC stayed in office for only three months and, in pursuance of a programme already set in motion before the uprising, allowed general elections to be held. On September 24 1979, the AFRC handed over power to the civilian administration of Dr Hilla Limann, leader of the People’s National Party which had won the elections. But the reported failures of the Limann’s administration to address the country’s economic challenges at the time resulted in his overthrow on December 31, 1981, ushering in a new revolutionary era. Flt Lt Rawlings became the Chairman of a nine-member Provisional National Defence Ruling Council, (PNDC) with Secretaries of State in-charge of the various ministries being responsible to the PNDC. The PNDC, upon assumption of office, set up a National Commission for Democracy (NCD) charged with formulating a programme for the realisation of true democracy. It was then the PNDC government made provisions for the establishment of elected district assemblies to help bring local government to the grassroots nationwide. Following this, in the year 1990, the NCD, at the prompting of the PNDC, organised forums in all the 10 regions of Ghana, giving Ghanaians the opportunity to make their views heard as to what form of government they wanted. These views were collated and analysed by the NCD, whose final report indicated that the people wanted a multi-party system of government. Resultantly, a Committee of Experts was appointed to draw up constitutional proposals for the consideration of a Consultative Assembly, leading the assembly to prepare a draft constitution based on proposals submitted to it by the PNDC, as well as previous constitutions of 1957, 1969 and 1979, and the report of the Committee of Experts. The final draft constitution was unanimously approved by the people in a referendum on April 28, 1992. This transitioned Ghana into the era of the Fourth Republic ushered in by Jerry John Rawlings, who ruled for two tenures under a democratic dispensation. Ghana has since the dawn of the Fourth Republic held periodic elections to elect its head of states and legislators. The organisation of periodic elections and peaceful change of government over the period has earned Ghana a good image in the comity of nations, as it has often been touted as the beacon of democracy in sub-Saharan Africa. The last of such peaceful elections was held on December 7, 2016, which led to incumbent President Akufo-Addo’s of the ruling New Patriotic Party (NPP) historic victory against then sitting Head of State, John Dramani Mahama, of the now largest opposition National Democratic Congress (NDC). Corruption still remains a major socio-economic problem in Ghana, and most corrupt officials who siphon huge public funds which are needed for national development, have for the most part in the Fourth Republic, been treated with ‘kid gloves’ by the law, even though ordinary men and women who steal paltry items not belonging to the state are punished harshly by the same laws of Ghana that fail to punish those who loot state coffers. There seems to be light at the end of the tunnel as far as the fight against corruption and abuse of public office is concerned, considering the passage of Special Prosecution Act. But as to whether the Act will progressively and sincerely punish corrupt officials remains to be seen. The country’s democracy and fight against corruption has further been deepened by the appointment of Lawyer Alamisi Burnes Kaiser Amidu as the Special Prosecutor, an appointment hailed by all and sundry in the fight against corruption. One of the gains Ghana made in the Fourth Republic has been the growth of media freedom and proliferation. The media in the Fourth Republic has arguably enjoyed freedom of expression than in any other era during the country’s six decade-old existence. For instance, the 1992 Fourth Republican Constitution opened up the media landscape for more media organisations to operate. This led to the establishment of the first private radio and television stations in Ghana, with a lot of private newspapers following suit. This was aptly explained by Prof Kwame Karikari when he said, “Nothing was now ‘sacred’ and the PNDC had its back to the wall. Never in the history of Ghana, since the twilight of colonial rule, was a ruling regime so pilloried by the press. Their tone and style were so polemical, aggressive and controversial that sometimes they raised professional and ethical questions (1998: pg. 176). President Akufo-Addo, in the special statement to the people of Ghana on January 7, 2018, which marked the silver celebration of Ghana’s Fourth Republic, he said despite the great achievements of the country, the issue of poverty, especially among rural folks, has remained with the country throughout the Fourth Republic. “The biggest challenge we face continues to be eradicating widespread poverty,” President Akufo-Addo stated. He mentioned that the country still has challenges in the performance of public services. “We face threats, traditional and contemporary, to our nation’s security and social stability, in the form of chieftaincy conflicts, land disputes, ethnic conflicts, vigilantism, cybersecurity issues, youth unemployment, economic hardships, and corruption in our public life,” Mr President said. He was emphatic that Ghana still has a long way to go as far as the improvements in the livelihoods of Ghanaians remain. President Akufo-Addo, taking responsibility in ensuring the country moves ahead in its development agenda, reiterated his administration’s fundamental commitment to resolving the challenges, within a framework of due process. He underscored, “We have begun to take a deep look at the structure of our economy and transform it from a raw material producing and exporting one to a value-added, industrialised economy, with a modernised agriculture to serve better our needs.